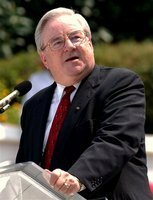 As most of you know by now, Jerry Falwell died today from heart failure. I just wanted to take this moment to offer my condolences to the family. Also, while I may disagree with him on some theological points, he has done much good for the Christian community. Not least of which are founding Liberty University and the Moral Majority. The Moral Majority was a powerful force in electing Ronald Reagan. Also pray for the college, their graduation is this weekend. It's kind of wierd that the two major colleges near our house have been badly hit in the past month.